This morning I joined friends at the old Sound Front Inn, now a rental "cottage." We enjoyed pancakes (with real maple syrup), sausage, coffee, and orange juice on the side porch, just a clam shell's throw away from the old Bragg cemetery. This house had once belonged to the Bragg family. In fact, there is some evidence that the original part of the building may be the second oldest surviving structure on the island. The lighthouse was built in 1823; the Sound Front Inn, maybe 15 or so years later. One wall is canted in a noticeable angle, and the front steps are not lined up correctly with the porch. The house was washed off of its foundation in the 1944 hurricane. It remains a silent witness to the destruction of that memorable storm. Today Pamlico Sound was calm and serene not far away. The sky is "Carolina Blue" and the air has just a touch of autumn in it. In less than an hour I'll be in a boat heading for Portsmouth Island. I think this is the perfect October day for a visit to this fascinating ghost village. It is 9:10 pm and I just returned from a nighttime visit to Springer's Point. I wasn't alone. I was with 21 teachers spending a week on Ocracoke participating in an NCCAT (NC Center for the Advancement of Teaching) seminar. 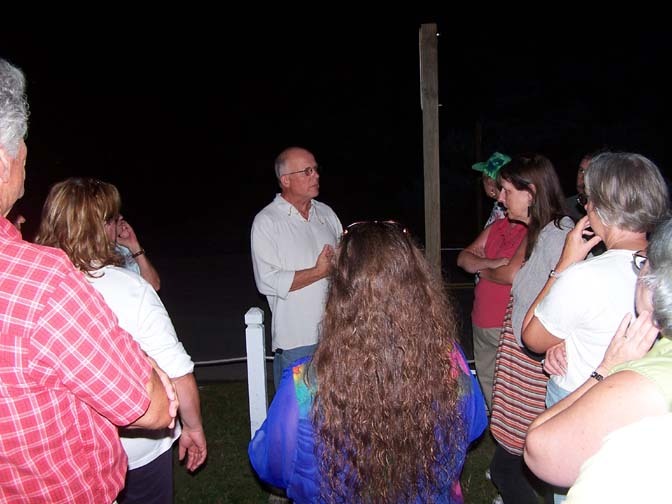 The seminar is entitled "Ghosts of the Coast" and we have been sharing creepy tales from the island, talking about what makes a good ghost story, and exploring the many family cemeteries in Ocracoke village. This afternoon we listened to a "paranormal investigator" who explained the tools she uses to hunt for ghosts. These include EMF (Electro-Magnetic Field) meters, infra-red cameras, and digital & analog recording devices. At 7 o'clock this evening we walked to Springer's Point and spent almost two hours in the eerie darkness there, under the canopy of live oaks and cedars, beside the lonely and forlorn cemetery, listening to the wind blowing through the gnarled and twisted branches above us. The ghost hunter called for spirits to manifest themselves as we stood in a circle around the old brick cistern. Cameras flashed, highlighting the investigator in front of a shadowy background of dappled branches and sinewy limbs. "Look, there they are, in our photos. See the orbs floating just above her shoulder!" I looked at the camera display. The "orbs" looked suspiciously like what I would expect from light reflecting off dust particles in the air. Springer's is dark and mysterious. There is no doubt about that. And the Point gives almost everyone an uneasy, unsettled feeling, especially after dark. But I suspect that just the sense of the unknown will have that effect. Actually, "ghosts" I can deal with. I for one couldn't help wondering if one of those big dark snakes I've seen crawl across the path during the day might be slithering close by. It was time to head back home. As promised, I am including in today's journal several photos (in no particular order) of various folk school classes and activities. Enjoy (and consider joining us next year in October -- everyone had a great time!). On Friday the heavens let loose and inundated Ocracoke with about six inches of rain. We needed the rain, like so many other places on the east coast, but it drowned out the annual school spook walk on Howard Street. It was a disappointment. Not only is the spook walk lots of fun....and many people had put hours and hours of work into the project....but it is also a big money maker for the school PTA. Haven't heard yet if it will happen on another date. The rain left huge deep puddles all over the village -- on roads, in yards, nearly everywhere one looked. But the island is drying out today. Lachlan enjoyed one big muddy pond this morning, stomping back and forth, eventually splashing above his butter-colored boots and soaking his trousers. That's all it took. In minutes his boots and pants were lying in the mud and he was tromping through the muddy water again, this time in his bare feet. I've got a CD of folk school photos. If I get a few spare minutes tomorrow or in the next several days I'll upload three or four so you can see some of what made this last week so memorable. I can't believe it's been four days since I last posted. This week has been a non-stop assortment of creative & exciting activities. The inaugural week of the new Ocrafolk School ended yesterday with presentations by all of the student participants. We looked at displays of colorful enameled jewelry, intricately woven baskets, and photographs of Ocracoke Island (none of which showed the lighthouse or Silver Lake Harbor!). We also heard stories of shipwrecks & rescues, saw an old-time island bird trap, and passed around biological specimens and examples of nautical knots. Earlier in the morning we were treated to a sumptuous breakfast prepared by the cooking class. I believe it's fair to say that everyone had a marvelous week. In addition to classes, we had the pleasure of enjoying music almost every day (jazz, classical, folk, and nautical), joined fellow students on walks along the shore and through the maritime forests, followed paths in the village while listening to history, stories, and ghost tales, and watched the wind catch the red sails aboard the traditional schooner, Windfall. It was a fun week, but also a tiring week. When off-islanders wonder what we "do all winter" just keep the folk school in mind. It is not always this intense, but we seldom get bored for a lack of activity. What a lovely day! It rained a bit last night (I only know because everything is wet outside this morning), there is a light breeze, and the skies are partly cloudy (I did see a fair amount of Carolina Blue sky earlier), but already the temperature is nearly 80 degrees. Several students from the folk school have headed to Pamlico Sound to launch their kayaks [unfortunately I am not able to join them : - ( ], and others are busily working on their baskets, jewelry, photography, or gourmet meals. I'm sure we'll hear all about their classes this evening at dinner. 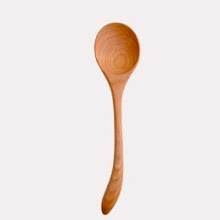 I can't let this day pass without a mention of its historical significance. According to James Ussher (1581-1656), Archbishop of Armagh, Primate of All Ireland, and Vice-Chancellor of Trinity College in Dublin, today, October 23, is the 6011th anniversary of the creation of the world. A momentous date if there ever was one. Let's celebrate! 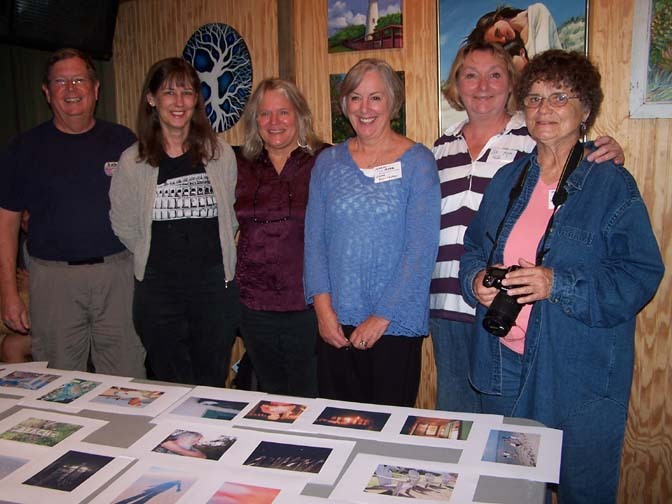 Last night more than two dozen folks met at the Pony Island restaurant for the first gathering of students and instructors of the new Ocrafolk School. We enjoyed a delicious meal while chatting and getting to know each other. This morning after breakfast at Deepwater Theater (David Tweedie & John Golden entertained us with fiddle and banjo music) I led the group on a tour down Lighthouse Road. I shared stories and local history. As an added treat, the Park Service opened the lighthouse so we could step inside and view the 184 year old beacon from a different perspective. We ended at the Community Store dock where Capt. 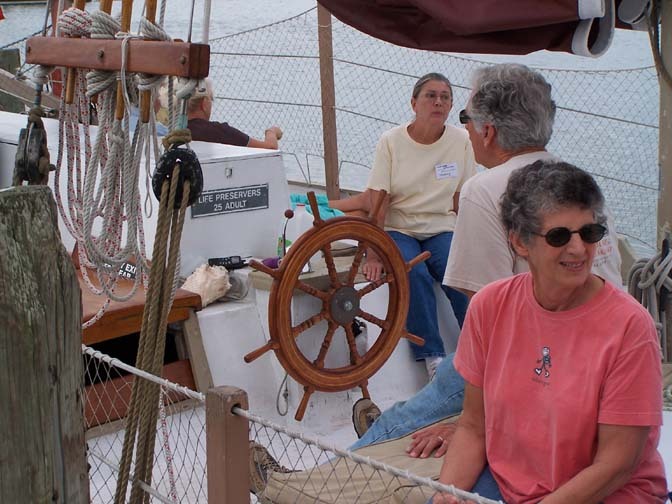 Rob invited everyone on board his schooner for and hour and a half cruise in Pamlico Sound. 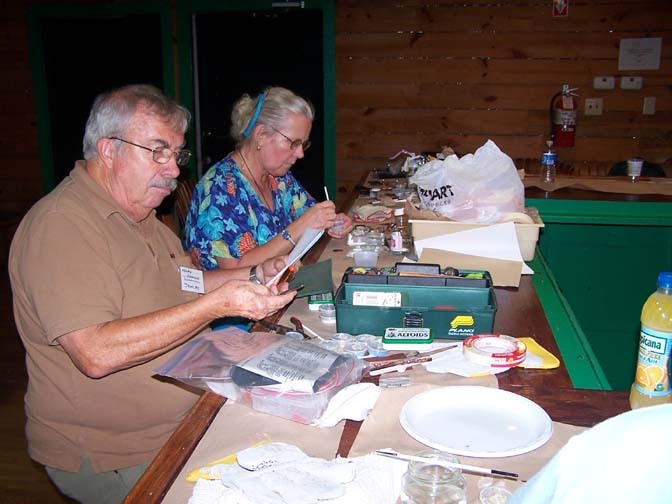 Classes in jewelry, basketry, photography, and island cooking, as well as an "Ocracoke Sampler" began this afternoon in various locations around the village. We will meet again this evening for John Ivey's famous fish cakes at Jason's restaurant. I'm sure the tables will be abuzz about all the skills learned already. We will all be looking forward to three more days of work, fun, and learning even more. Sorry for the two-day hiatus from the journal. This weekend Ocracoke welcomed the Howard family reunion. My brother was here, along with close and distant cousins. In addition to registration, a picnic, and dinner we enjoyed sharing stories, listening to good music, dancing the traditional island square dance, and even watching an accomplished belly dancer (one of our mainland Howard kin). At the same time, NCCAT (the NC Center for the Advancement of Teaching) hosted an open house, shrimp dinner, and community cookout this weekend. Their new facility, the renovated Coast Guard Station, is simply wonderful. Conference and seminar rooms, dormitory rooms (each with private bath), reception area, open deck, and dining room are all beautiful and of the highest quality. The view from the lookout tower was a highlight of everyone's visit. We welcome NCCAT to our community. In just a few minutes I will be meeting our first students for the new Ocrafolk School. Right now I'd better get a shower and then bike out to the Pony Island Restaurant. After dinner I'll be leading a Ghost & History Walk for several British journalists. More on the Ocrafolk School later this week. As humorist Dave Barry would say, an "alert reader" reminded me yesterday that the Ocracoke School Halloween Carnival and Spook Walk will take place on Friday, October 26, followed by Quizo (Bingo). I also forgot to mention the chicken dinner served last evening as a fund raiser for the Ocracoke Child Care. I wasn't able to partake, but I'm sure it was delicious. There really are quite a few community events happening in the next few weeks. If you are planning a visit to the island (for the Howard Reunion, the Folk School, the A.A. Jamboree, the Murder Mystery Weekend, or just to get away for a while) be sure to plan for a dip in the Atlantic. The ocean temperature has been just perfect for swimming. Everyone on the island is basking in the warm weather, sleeping with windows wide open, and enjoying the outdoors as much as possible. The village is not as quiet in October as it once was, but there are definitely fewer visitors out and about this week. Everything seems more relaxed and laid back. However the next few weeks will see more activity here on the island. 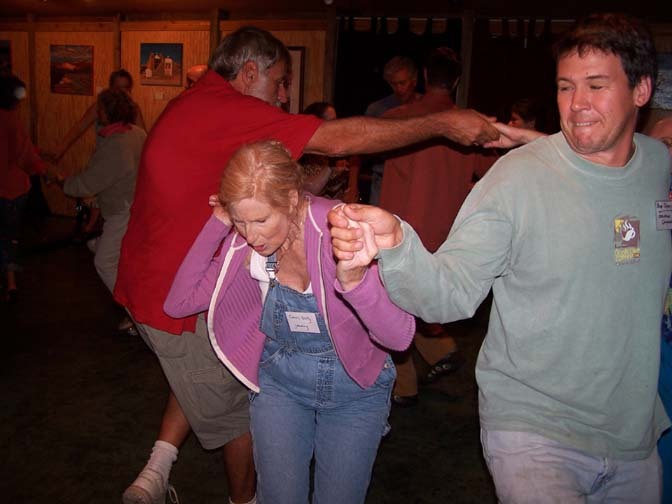 A large Howard family reunion will meet this weekend at the community center. Latest reports indicate that more than 150 people from all over the country will be gathering to share stories, photos, and history. A picnic, dinner, music, and dance will round out the weekend. 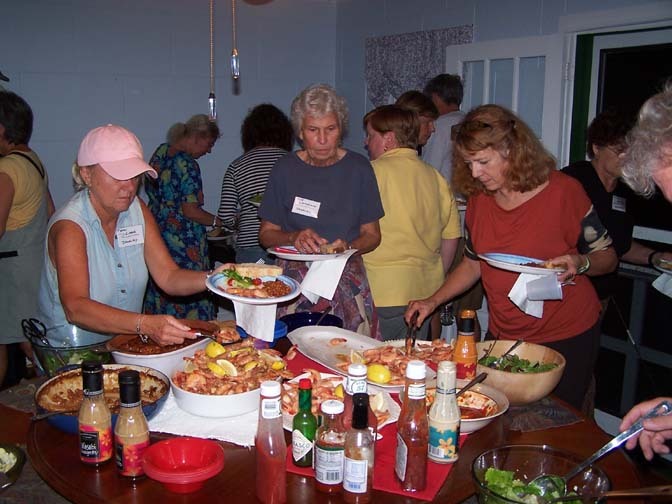 Close on the heels of the reunion will be a community cookout to celebrate the opening of the NCCAT (N.C. Center for the Advancement of Teaching) campus (the old Coast Guard station) on Sunday, October 21. The next day will be the inaugural session of the Ocrafolk School. 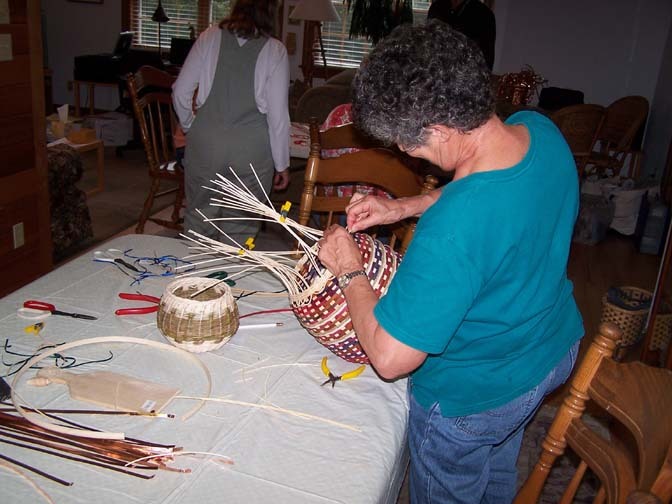 On October 22 classes will begin in jewelry making, photography, island cooking, basketry, and island culture, history, & ecology. 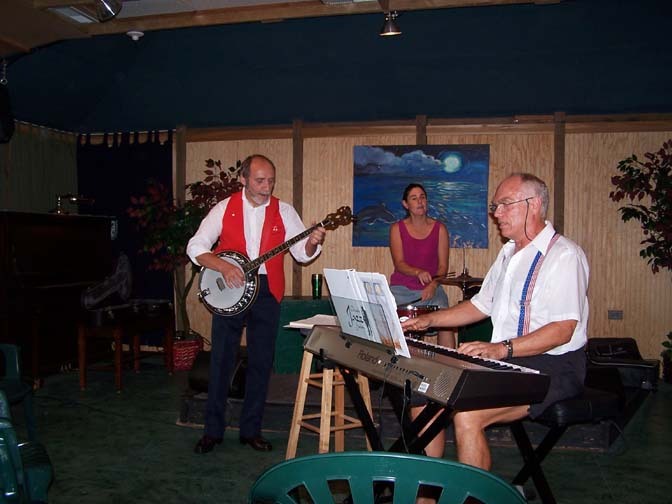 Evenings will include music, square dancing, sailing, and other island activities. 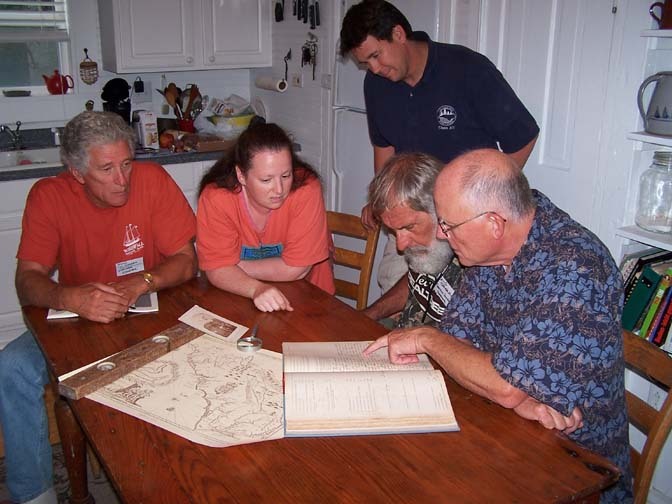 Following the folk school NCCAT will be hosting a seminar on "Ghosts of the Coast" the week of October 28. That session will barely be concluded when the island hosts the annual A.A. Jamboree. The next weekend Lou Ann will be back on the island to lead a "Murder Mystery Weekend" at the Cove Bed & Breakfast. When that ends it will be the middle of November! Whew. We'll keep you informed as the events unfold. This morning the birds were chirping and singing, sunbeams were streaming down through the cedars....and goldenrod was in full bloom all over the island. This week is proving to be as grand and beautiful as one could imagine. The temperature right now is 72 degrees. Amy & Lachlan & I played "baseball" in the yard a while ago. They are planning to be outside as much as possible today. The only downside to this weather is the goldenrod, but I'll simply cough and sneeze every morning, and then get on with enjoying the rest of the day. Yesterday proved to be a super October day, and today looks to be just as nice; even a tad warmer, probably with temperatures in the mid-70s. It is clear and sunny, unlike October 14, one hundred and eighteen years ago yesterday. It was on that date that the steamer "Pioneer" wrecked on Ocracoke's beach within sight of the village. Unlike most vessels which carried one type of cargo (lumber, molasses, rum, or sugar, e.g. ), the Pioneer was carrying general cargo. When it broke up and sent all manner of desirable goods floating through the town residents were ecstatic. Many of our readers knew Phil Platt, owner and pilot for Ocracoke Island's Pelican Airways. I spoke with Phil early in the week while checking my mail at the Post Office. Late that afternoon Phil died suddenly. He was one in a long list of island characters. Strong willed, quirky, and quick to tell you what he thought, Phil was interesting, entertaining, and likable. My first encounter with Phil was seeing him driving around the village in a car with most of the windshield broken out. There was a large hole in the passenger's side; the driver's side of the windshield was nothing more than cracks and "spider webby" lines obscuring any possibility of a view of the road. Phil, with hands on the wheel, was leaning far to his right, peering out of the broken glass. He was wearing his vintage leather flight goggles. The memorial service was held today at the airstrip. A catholic priest was there, along with Joyce, our Methodist minister, and Dwight Burrus, lay preacher and pilot from Hatteras. The altar was Phil's rough work bench, stained with grease & oil. On the corner was Phil's vise, bolted firmly to the top. It was a fitting testimonial to a memorable island character. We will miss him. After weeks of unseasonably warm autumn weather, it turned a bit cooler yesterday. A neighbor I spoke with in the bank told me with a smile on his face how he'd slept under two blankets. Folks were walking and biking about in sweatshirts, light jackets, and hats. This morning the "cold snap" (my apologies to all of our northern readers) is quickly morphing into the perfect, sunny day. Already the temperature is in the upper 60s, and is expected to be in the lower 70s by mid-morning. Nighttime temps in the mid 50s will be a fitting complement to what is shaping up to be a lovely October day. "Blue Heron Realty invites you to vacation in one or our Ocracoke Island rentals. We take great pride in our island home, this one-of-a-kind place on the North Carolina Outer Banks, known for the incomparable beauty of its land- and seascapes-- and for the wonderful people who call it home. My goal for Blue Heron Realty is to offer an Ocracoke vacation rental service that matches the island itself – a company founded on the island’s traditions of hard work, friendliness, in going the extra mile and keeping things simple. You won't find national hotel and motel chains and the "usual suspect" fast food restaurants on Ocracoke Island. Yes, Ocracoke will grow and change, shifting like the tides. Still, we all want it to hold on to the values and customs that make it unique. I hope you will enjoy your vacation rental on our Ocracoke. Leave your footprints in the sand and take away with you enough happy memories to last a lifetime (and plenty of seashells too!). I meant to write a journal entry yesterday. Really I did. But I have been playing catch up since I returned home. You know what I mean -- bills, emails, family, friends, mowing the lawn, laundry....and, of course, work. And the Village Craftsmen has been busy for this time of year. Of course, Kelly, our summer employee, is now gone, and Dallie has been off island this week. So Jude and I are keeping things going. But we have been blessed with warm, pleasant weather. I did join Amy for a walk on the beach right after I got home (including a dip in the ocean -- the water is warm and very inviting! ), but that wasn't to be yesterday. Although shop owners are happy for the continued revenue, I believe many folks are becoming wistful for cooler weather and a slower pace. ....or at least points to ponder. The East Coast (nay, the whole world)NEEDS your unspoiled serenity, not another overpriced, honky-tonk wasteland! OK, this is a comment, not a question, but it is typical of so many comments of our readers who replied to Jude's initial post. (I chose this comment as representative of many others.) I can only say that I agree with this sentiment wholeheartedly, and with the others who long for the Ocracoke they love and cherish not to "change" in the sense of becoming like every other coastal tourist trap. You folks need to hold on tight to what you have as long as you can, because when it's gone there's no going back. I don't want Ocracoke to lose the charm that it has. That's what keep bringing people back year after year. If Ocracoke winds up like a Myrtle Beach, then what have you got?. I believe I speak for most, perhaps almost all, of our island residents when I agree that Ocracoke needs to hold on to our sense of community, our culture, our traditions, our lifestyle, our sense of humor....(you fill in the rest of the blanks). What is your background in writing, language, etc? Your abilities as a writer are uncommonly good and suggest specialization in the field, or perhaps a career in teaching. Am I close? Thank you for the kind words. Well, you are only close. I did teach a couple of years off the island; and I taught here at Ocracoke way back in the mid-70s. But I have no background in education. Wasn't really a very good teacher, either. At least I don't think I was that great. However, I love to read....and think. My educational background is in Philosophy and Religion. It's a wonder anything I write makes any sense. One would only hope that Ocracokers have their zoning laws in order, and that esthetics and "quality of living" trumps "making money" under at least [some?] circumstances. Also, that the cost of living is somehow kept down so that the kids of native Ocracokers can afford land and a house AND non-natives of modest means can continue to visit and stay in Ocracoke. I would hate to think that in 20 years only rich people could live or vacation on OK Island. Whoa! This is a complicated question/comment. Actually I have few answers. Ocracoke has no zoning laws (in the sense of commercial, residential, and industrial "zones"). We do have a building ordinance, but not a particularly strong one, and enforcement is problematic. For one thing, our county seat is so far removed, and we have so little influence in county decisions. It is very complicated. Also, many other factors complicate this issue. To name just one, strict building codes, for all their good intentions and benefits (and there are many), tend to drive home prices up. When large lot sizes are mandated, and various restrictions are placed on construction, properties (especially in coastal communities) become more desirable, and thus more expensive. I wish I knew a solution to this dilemma. How much more do you think the island can change? For example, how many more buildable lots are available? Is there the potential for lots more to be constructed or is most of the large places already full? Around the harbor, how many more lots do you anticipate will change or built upon? Can the towns infrastructure handle another building boom? I don't know the answer to this question. But I do know that almost anything is possible, and all too often small communities like ours are re-active, rather than pro-active. How do you identify the next potential problem? How do you know you're right? How do you convince your fellow citizens to prepare for something that may never materialize? How many buildable lots are available? I own four contiguous lots that total about an acre. Could I bulldoze everything down, connect the lots, and build a motel? I suppose, but, of course, I wouldn't. But how could we prevent someone else from doing the same thing? I don't know. I wonder though if Portsmouth wouldn't have discovered a new breed of folks if the government hadn't stepped in. Perhaps. An "artists' community?" Maybe an experimental Utopian society? It might have been wonderful, creative, and exciting. But it wouldn't have been the traditional island community. I hope that there are ways for the next generation to be able to afford to stay on the island if they want. We all hope for this. But it is a struggle. By now, most local families have pretty much divided up their traditional holdings for children and grandchildren. We'll have to see what will happen to the next generation. If only we could halt change. But then, what would we be hoping for. As I said before, change is inevitable. The only rational goal is to direct the change and work for change that is life-affirming and community-building. And then we need the good graces to accept the changes and to continue to strive for all that is good and healthy and nurturing (even if that means working for other changes). I hope this discussion has prompted us all to do whatever we can to preserve all the best of this wonderful island of Ocracoke. It's so nice to be missed. Thanks for the concerns about us. If you read Dale's comment on the last post you already know that I have been off the island for more than two weeks, and that Jude has gone to visit her mother. But I have returned....just last night. I spent a week in Indiana with Lou Ann. We had a wonderful time -- rode on a train with a 100+ year old steam locomotive, witnessed a Civil War re-enactment (even had the opportunity to don period costumes and join in the dances later that evening), visited friends, walked in the woods, and generally enjoyed ourselves. From there I traveled to East Tennessee for my annual hike to the top of Mt. LeConte (over 6500 feet elevation). It is an eight mile trek to the top, and quite a treat to be out in the woods and into the rarefied air. Two friends even startled a large black bear early in the morning, just beyond our quarters. From LeConte I hopped over to Weaverville, NC to visit with my son and his family. I see those three grandchildren only a few times each year, so it is always a treat. Then it was back to Tennessee for the National Storytelling Festival. Lou Ann joined me again, and we listened to some of the best tellers in the nation (including, of course, our own Donald Davis). Back home I discovered tall disorderly and unkempt grasses assaulting my front yard, stacks of unwelcomed bills, and more than a hundred emails awaiting me. Thank you all for your comments about Ocracoke and change. I'd like to share more thoughts on several of the posts, but that will have to wait for another day. Until then, enjoy the rest of the day.